Vasuvum Saravananum Onna Padichavanga (VSOP) is a Tamil romantic comedy directed by M. Rajesh. 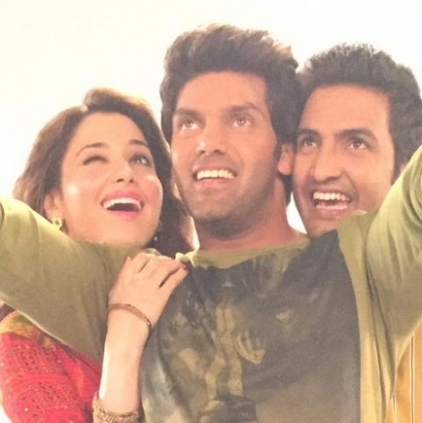 It stars Arya, Tamannaah and Santhanam. It's not a sequel of Boss Engira Bhaskaran though. It looks like director Rajesh is all set to wrap up the talkie portions of his upcoming film Vasuvum Saravananum Onna Padichavanga (VSOP) that has Arya, Santhanam and Tamannaah in the lead. If reports are to go by, only two songs remain to be the shot in the masala entertainer. The film has Vishal playing a special cameo. Bhanu, Karunakaran and Vidyullekha Raman comprise the rest of the star cast. Music for the film is by D Imman.